Home > Comet Clutches and Parts > Comet 216826C. 90D Driven for PUG > Comet 216836A Reverse Wind Spring for 90D Secondary Pulley. > Comet 212291A Driven Clutch. 1" Bore. Comet 90D. Comet 212291A Driven (Secondary) Clutch. 9.91" Diameter. Comet 212291A Driven (Secondary) Clutch. 9.91" Diameter. Comet Industries 90D Series Clutch. 1" bore, INBOARD mount (Outboard mount available with optional spring kit). DELIVERS A DRIVE RATIO = 3.49:0.78 USING A 94C DUSTER DRIVE CLUTCH. Use only with Comet Industries 1-3/16" drive belts. *NOTE: Some applications, like King Midget cars, will require OUTBOARD Mounting of Cam. Please use COMET PART 216836A Reverse wind Cam Spring to allow Driven unit to work in the opposite mounting position. Thank you! Comet 216836A Reverse Wind Spring for Comet 90D Driven Units (Blue). Allows for Outboard mounting of Comet Industries 90D Secondary pulleys. Comet 212292A. Comet Industries 90D Series Driven Clutch. 1" Bore. Comet 212292A. Comet Industries 90D Series Driven Clutch. 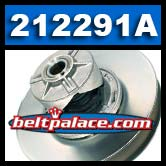 Comet OEM Part 212292-A. Specs: 9.91� Diameter, 1� Bore, 1/4� Key, 1-1/4� TW Belt.